If your life won't be complete until you own the fastest production Volvo ever, raise your hands now. 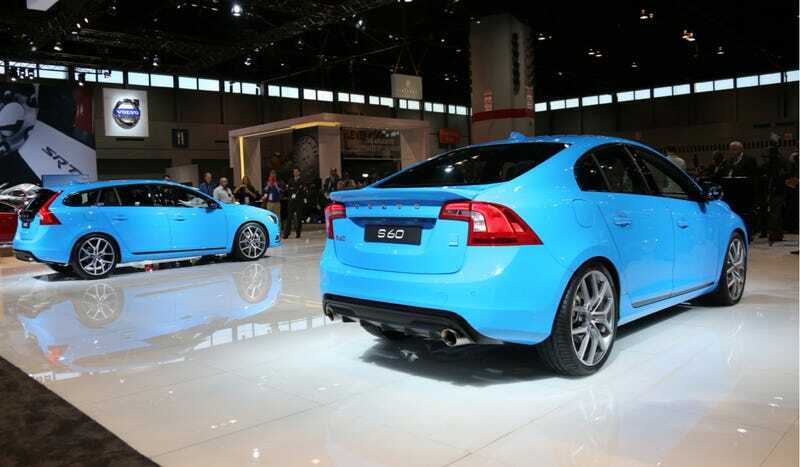 There are just 120 of the Volvo S60 and V60 Polestar super Volvos coming to this country in June, and they look to be worth standing in line for. We just drove the 2015 Volvo V60 and found it to be a compelling package. Add more power and of course it'll be even more appealing. The important points of the Polestars include the 3.0-liter turbo six that now pumps out 345 horses, 20 more than the current top-tree T6 R-Design. It also packs 369 lb.-ft. of torque, which is why the Polestars get 14.6-inch ventilated front discs with six-piston Brembo calipers, and 11.8 inch ventilated discs at the rear, to go around the 20-inch wheels. The big brakes and high-performance shocks will be good, because Volvo says the Polestars get to 60 in 4.7 seconds. A sub-5-second 0-60 time from a gorgeous blue wagon? Who needs to save for college, anyway? Oh, and if for whatever godawful reason you're not in love with the Rebel Blue paint, it's also going to be available in Black Sapphire Metallic.